Serge Gainsbourg was an iconic and unique personality in French popular culture, an artist, pianist, composer, singer and artistic provocateur, whose louche and unorthodox approach to life inevitably attracted scandal as well as making him a cult style guru of his times, and beyond. Beginning as a teacher and artist, he turned to music as a pianist and composer, reluctantly becoming a performer as well. Beginning his recording career in 1958, and working in a style that combined his jazz roots with the prevailing chanson genre, he made four albums over the next four years, at the same time finding an outlet for his music in the arty French film world, both as a composer and performer. He achieved his greatest notoriety, of course, with the sexually-charged international No. 1 with Jane Birkin “Je T’Aime, Moi Non Plus”, recorded outside the scope of this collection. 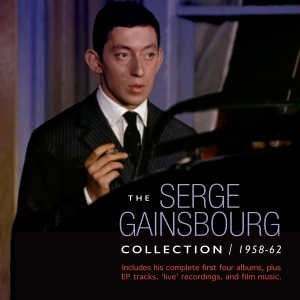 This great-value 53-track 2-CD set comprises the complete content of those four LPs, in their original order, interspersed in chronological order with a track he recorded for release on an EP with existing album tracks, the complete content of another EP, and material which he composed for two movies. Included at the end is a recording of one of his songs by Juliette Greco, done for a short film, concluding with several titles from a ‘live’ performance of material from his first album. His activities over the years attracted admiration and opprobrium in equal measure but he remains a personality whose work is much in demand, his cool, taboo-shattering approach attracting attention from succeeding generations. 20 Angoisse Orchestra conducted by Alain Garaguer. 21 Black March Orchestra conducted by Alain Garaguer. 1 Generique Orchestra Arranged & Conducted by Alain Garaguer. 2 Fuite Du Rouquin Orchestra Arranged & Conducted by Alain Garaguer. 3 Les Loups Dans La Bergerie Orchestra Arranged & Conducted by Alain Garaguer. 4 Cha Cha Du Loup Orchestra Arranged & Conducted by Alain Garaguer. 5 Les Loups Dans La Bergerie (Fin) Orchestra Arranged & Conducted by Alain Garaguer.